Rearranged Ireland region open day - Saturday 23rd June. The Jss Ireland committee have decided to hold an informal Open day at the Kingarrow flock in Omagh (BT79 7TX) @ 1pm followed by a visit to the Ulster American folk park @ 3pm, only a 5 min drive away from the flock visit. All members very welcome and also non members who have an interest in jacob sheep. Please let us know via facebook, phone or text or asap if attending so we have actual numbers. The ulster american folk park is a great visit with over 30 exhibit buildings telling the story of three centuries of Irish emigration. The cost for a group of 15+ is £6.95 each and this can be paid directly at the entrance. Rooms have been booked in the Mellon Country hotel only one mile away from the Folk park and we have agreed a special rate with them for 2 people B & B and evening meal. The Jacob Sheep Society and the Ireland Region would like to welcome our newest members who have joined in 2018 - Mr Patrick McGlynn, (Cloghan - Co Donegal), Mr Andrew Montgomery, (Portglenone – Co Antrim ) and Mr Trevor Kane (Tandragee – Co Armagh). The Show Competition was a huge success in 2017 and saw even more members took to the show ring.It will include 9 shows in the North and 11 in the South this year. Points will be awarded for attending shows, 1st, 2nd & 3rd place in Ram, Ewe, Ewe lamb & Ram lamb classes and for Champion & Reserve Champion.The competition takes the same format as last year with scores from six of the shows counting towards the final scoring which means that members don’t have to attend all shows in order to be in with a chance of winning the prizes. A big thank you to our sponsor – Richard Beattie Livestock Sales – Gortin. Showing at local shows is a great opportunity to meet other members and to show the general public the quality of Jacob sheep that are currently in Ireland. It is also a great place to advertise the sheep that you are going to be selling at the Official sales. Prizes and trophies will be presented at the Ireland Region Agm in October 2018. This year`s Open day will be held at the home of Martin and Bernie Harney - Green Star Jacobs, on Sat 3rd June at their home in Ballinasloe, Galway. The pedigree Jacob flock consisting of 22 ewes run alongside their commercial flock of 120 ewes which are all looked after by Martins sons – Kevin & David. 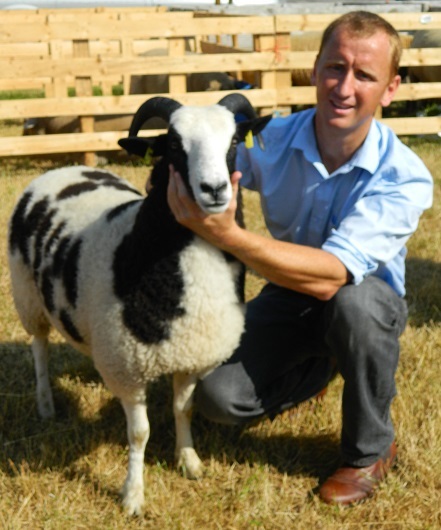 The Green star flock purchased their first Jacob ram in 2001 and they joined the JSS in 2003 when they purchased a pedigree ram from Derek Brown. The Harney family show their Jacob sheep at most of the shows in Ireland and their most notable success in the last few years was winning the Southern Ireland show and sale championship in 2015 at Tullamore with their homebred shearling ram - Green Star Tim. I hope that as many members as possible can attend this years Open day as it is a great social event in the calendar and it is a great opportunity to meet up with other members in our region. The Open day will start at 1pm and there will be lots to keep young and old entertained throughout the afternoon.. More details with directions etc will be sent out in the Spring Newsletter Martin has agreed a special rate (110 euros for a double or twin room – B&B) with the local hotel – Gullanes hotel, Main street, Ballinasloe and 10 rooms have been reserved for any JSS members who wish to stay over and make an evening out of it. This is now becoming a regular date on the Jss calendar and always proves to be a very enjoyable night. Please contact hotel directly – 00353909642220 and quote - Jacob sheep society to avail of the price. Please contact Martin - 00353872296656 or Paul - 07715326021 to let us know if attending so we have an idea of numbers on the day. The 5th Northern Ireland Official Show & Sale will be held on the earlier date of Sat 5th August in Gortin Mart (Co Tyrone). There were 145 entries last year and I think all members went home very happy with the prices they received in the ring. The key to this show & sales success is for members to continue to bring the best quality sheep they can for sale. Good sheep means good prices and a good reputation for your flock. Bad sheep will probably do as well in the factory. Robert Locker will be travelling over from Scotland to judge along with Gordon Connor & Scott Dalrymple who will be doing the pre show inspection. The show will start at the slightly earlier time of 11am and the sale at 12.30pm (Sheep to be penned by 9.30am). Entry forms will be sent out in June.